Last night on Facebook I asked what foods come to mind when you think Easter. The top three answers were: Ham (or some other pork dish), Salads (Waldorf, Broccoli Raisin, Pasta, etc. ), and Deviled Eggs. I couldn't agree more! I am hosting Easter this year and we have all three foods (plus more!) on our menu. I'm planning on baking a ham and/or smoking a pork loin and making plenty of salads (including my Overnight Salad). 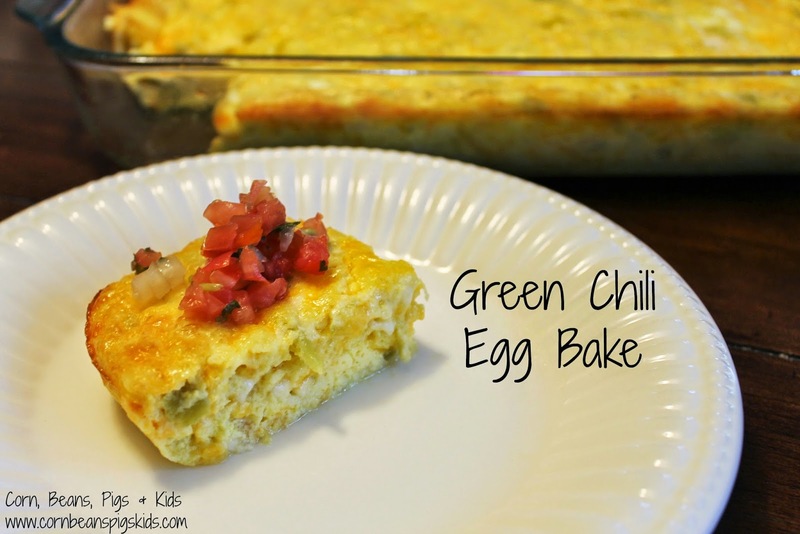 One other thing I'm planning on making is Green Chili Egg Bake. I feel like it is only right to start Easter morning with an egg bake! I have many memories of helping youth group make Easter Breakfast at church, so it only seems appropriate to carry on the tradition in my home. This Green Chili Egg Bake is cheesy and buttery; plus, the green chilies give it that added something! A surprise ingredient in this egg bake is AE Dairy Cottage Cheese! The cottage cheese helps give the egg bake a creamy texture. I used my favorite AE Cottage Cheese - their Old Fashioned variety, but any of them would work nicely. It'd be fun to try it again soon with one of their flavored varieties: Mr. E's French Onion or Mr. E's Garden Vegetable. Lightly coat a 9 x 13-inch baking dish with nonstick spray, set aside. In a large bowl, beat the eggs until well blended. Stir in the shredded cheese, cottage cheese, melted butter, flour, baking powder and salt; fold in the chilies. Pour the mixture into the prepared baking dish and bake for 30 to 35 minutes (or until the eggs are set) at 350°F. Cool for 10 minutes before slicing and serve with salsa. So start off your Easter morning with this delicious egg bake. It'll be a sure family favorite! What food do you think of when you think of Easter? Do you associate Egg Bakes with Easter morning like I do? Remember to Comment for a Cause! This looks and sounds very tasty. Gathering fresh eggs every day and having plenty on hand I am going to try this very soon. Thank you for sharing. Smiles and Blessings to you and your family. This looks so good! I would love a bite right now! We love egg bakes! So good to make and reheat, too! Yes! So good as leftovers too. The flavors in this sound amazing! What a great way to start the day! The flavors are what makes this egg bake a favorite in our house!